Raymond Deshaies is investigating the cellular machinery that mediates protein degradation by the ubiquitin-proteasome system (UPS), and how this machinery regulates cell division. Ubiquitin serves as a molecular tag that marks proteins for degradation (Figure 1). Ubiquitin is attached to proteins by a cascade of enzymes comprising ubiquitin-conjugating enzymes (E2s) and ubiquitin ligases (E3s). We investigate protein degradation via the UPS at multiple levels, including: the regulatory circuitry that acts upstream of ubiquitin conjugation pathways that control cell division, the ubiquitin ligases that mediate attachment of ubiquitin to proteins, and the mechanism by which ubiquitin-modified proteins are brought to the proteasome and degraded. We seek to discover new components of the UPS and uncover basic knowledge about how components of the UPS work, how their activities are regulated, what their substrates are, and how they contribute to cellular regulation. Given that defects in the UPS lead to cancer, neurodegenerative diseases, and autoimmune disease, we anticipate that a better understanding of the basic biology of the UPS will provide insight into diseases that afflict millions of people and we hope that this insight leads to novel therapies. Figure 1: Ubiquitin-dependent proteolysis. Ubiquitin (Ub) is activated by covalent attachment to E1 enzyme in an ATP-dependent reaction and is subsequently transferred to an E2 (ubiquitin-conjugating) enzyme. Ubiquitin is transferred from E2 to target substrate with or without the assistance of an E3 (ubiquitin ligase) enzyme. E3s control the specificity and timing of ubiquitination reactions. After several cycles of ubiquitination, the multiubiquitin chain-bearing substrate is recognized by the 26S proteasome and degraded. Our work to understand the biochemical mechanism by which yeast cells enter into the 'S phase' of the cell division program where they duplicate their chromosomes led us to discover the SCFCdc4 ubiquitin ligase, one of whose jobs is to attach ubiquitin to a protein known as Sic1 (Figure 2). Sic1 restrains chromosome duplication by binding to and inhibiting the S phase-promoting cyclin-dependent kinase. At the end of G1 phase, which precedes S phase, SCFCdc4 binds Sic1 and attaches ubiquitin to it. An enzyme complex known as the 26S proteasome then degrades ubiquitin-modified Sic1. In this manner, active cyclin-dependent kinase is released from Sic1, so that it can promote chromosome duplication. Figure 2: Control of cell division by ubiquitin-dependent proteolysis. SCF ubiquitin ligase enables the entry into S phase by promoting degradation of the S-phase cyclin-dependent kinase inhibitor Sic1. APC (anaphase-promoting complex) ubiquitin ligase enables chromosome segregation and exit from mitosis by promoting degradation of Pds1/securin and mitotic cyclin (cyc B), respectively. Although SCFCdc4 was discovered as a regulator of chromosome duplication in yeast, we now appreciate that it is the archetype of a superfamily of ubiquitin ligase enzymes that share a similar modular architecture. At the core of this superfamily is a module comprised of a cullin subunit and a RING subunit, and hence these enzymes are referred to as cullin-RING ligases (CRLs). The cullin-RING module recruits both an E2 enzyme via the RING subunit and a substrate-binding module. In this way, substrate and E2 enzyme are brought into proximity to enable substrate ubiquitination (Figure 3). Figure 3: Modular architecture of SCF and other cullin-RING ligases. Phosphorylated (P) Sic1 is recruited to SCF via the Cdc4 substrate receptor. Cdc4 is incorporated into SCF via its F-box domain (F), which binds Skp1. Skp1, in turn, binds the N-terminal domain of Cul1. The C-terminal domain of Cul1 binds the RING subunit, which recruits the E2 enzyme. In the example shown, E2 enzyme is thioesterified with a ubiquitin (Ub) molecule that will be transferred from E2 to substrate as indicated by the arrow. N8 refers to the ubiquitin-like protein Nedd8, which is reversibly conjugated to the Cul1 subunit (see Figure 4). There are ~10 cullins and cullin-like proteins in humans. The Cul1 subunit that underlies SCF ubiquitin ligases binds the linker protein Skp1. Skp1, in turn, binds the F-box domain of a substrate receptor protein. There are ~70 F-box proteins in human cells, and thus potentially as many as 70 distinct SCF ubiquitin ligase complexes, each with a different substrate specificity. Each cullin uses a different linker protein to recruit a different family of substrate receptors. All told, there may be 350 or more CRLs in human cells. These enzymes control processes as diverse as circadian rhythms, the innate immune response, and glucose sensing. Given their key role in numerous regulatory pathways, we seek to understand how CRLs work, how they are regulated, what their substrates are, and how they are deployed in regulatory circuits to control processes such as gene transcription and cell division. We are also developing methods to use small molecules to target specific proteins to CRLs, in an attempt to exploit the activity of these enzymes to rid cells of proteins that contribute to disease. Despite their pivotal role in numerous regulatory pathways, we know relatively little about how CRLs work. Degradation of CRL substrates like Sic1 is sustained by attaching to the substrate a chain of ubiquitins linked together via their lysine 48 residues. How do CRLs like SCFCdc4 sustain processive ubiquitination of their substrates in the form of a lysine 48-linked ubiquitin chain? How does SCF ubiquitinate substrates given the existence of a large gap between the substrate and the ubiquitin-conjugating enzyme when both are bound to SCF? What are the mechanisms that govern whether or not a protein is a substrate for a CRL? This last question is of particular relevance for SCFCdc4, since the epitope that tethers Sic1 and other substrates to the Cdc4 F-box receptor subunit is highly degenerate. We plan to address these and other questions by employing chemical biology approaches to develop novel substrates and tools, by devising new assays based on fluorescence techniques to measure in real-time the binding of a ubiquitin-conjugating enzyme and substrate to a CRL and the transfer of ubiquitin from the former to the latter, and by developing structural and mathematical models to help us understand how the assembly of a ubiquitin chain proceeds. Because of the broad role that human SCF and other CRL enzymes play, we sought to identify proteins that control SCF activity. This led us to discover that COP9 signalosome (CSN) is a key regulator of all CRLs. CSN detaches a ubiquitin-like protein, Nedd8, from the cullin subunit of CRLs. This reaction is catalyzed by the Csn5 subunit, which together with the related Rpn11 subunit of the proteasome defines a new family of 'JAMM' domain metalloproteases. CSN was previously implicated in multiple developmental processes, including photomorphogenesis in plants, neuronal differentiation, and axon guidance. Our observations suggest that the diverse activities of CSN may arise from its ability to control CRLs and other Nedd8-modified proteins. Figure 4: Hypothetical model for a cullin cycle sustained by reversible modification with Nedd8. This model incorporates CAND1, which is not discussed in the text. CAND1 can only bind to Cul1 that is not modified with Nedd8. CAND1 and Skp1 bind Cul1 competitively. (1) Active CRL is deneddylated by CSN (2). This may preferentially occur upon exhaustion of available substrate. Deneddylation enables the protein CAND1 to displace Skp1 from Cul1 (3), leading to complete sequestration of Cul1 by CAND1 (4). It is not certain how Cul1 is mobilized to re-assemble into active SCF complexes. One possible scenario is drawn here. Ubc12, possibly with the assistance of an unknown factor X, conjugates Nedd8 upon Cul1 (5), which initiates CAND1 dissociation and enables binding of Skp1-FBP (1). Alternatively, Skp1-FBP could displace CAND1, allowing for neddylation of Cul1 by Ubc12. How CRL substrates are deliveried to the proteasome and degraded Once a protein is conjugated with a lysine 48-linked chain of ubiquitins, it is degraded by the proteasome. We are using Sic1 as a model to investigate how the proteasome recognizes and degrades proteins. Our work has revealed that Sic1 can be shepherded to the proteasome by two different receptor proteins that bind to both ubiquitin chains and the proteasome. We seek to understand why there are multiple pathways for delivering substrates to the proteasome, how these pathways work, and how they contribute to specificity in the ubiquitin-proteasome system. Once ubiquitinated Sic1 complexed to a cyclin-dependent kinase arrives at the proteasome, the complex is disassembled to release active cyclin-dependent kinase. Concomitantly, the novel JAMM domain metalloprotease Rpn11 removes the ubiquitin chain from Sic1 as a prelude to its degradation (Figure 5). We seek to understand how Rpn11 works and how its activity is coupled to the unfolding and degradation of ubiquitin-conjugated substrates. Figure 5: Substrate (squiggly purple line) is targeted for degradation at the hands of the proteasome (blue cylinder) by attachment of a tetraubiquitin chain (green lollipop). The ends of the proteasome cylinder are capped by the 19S regulatory particle, which is subdivided into "lid" and "base" complexes. The base hydrolyzes ATP to unfold substrates and open a channel into the proteasome cylinder, whereas the lid confers ubiquitin dependence on degradation. The substrate first binds the proteasome via its ubiquitin chain and is then threaded into the interior of the proteasome cylinder, where it is degraded by the action of the 20S peptidase. 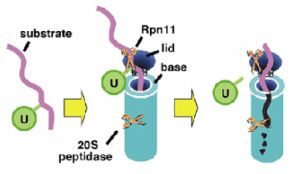 As the substrate is being threaded into the proteasome cylinder, the tetraubiquitin chain is removed by the isopeptidase activity of Rpn11. If the tetraubiquitin chain is not removed, degradation of substrate is inhibited, presumably because the bulky tetraubiquitin chain impedes translocation of substrate through the narrow opening of the proteasome cylinder. A recent topic of interest to us concerns the mechanism of action and regulation of the Cdc48/p97 AAA ATPase in turnover of soluble substrates of the UPS. Some proteasome substrates require Cdc48 to be degraded, but the mechanism by which Cdc48 works remains obscure. Adding to the mystery is the fact that there are about a dozen different Cdc48/p97 complexes in human cells. Existing data suggest that these complexes act downstream of ubiquitin ligases and upstream of the proteasome, but other than that we have little insight into what they are doing, why so many different complexes exist, and how their activities relate to the action of the ubiquitin chain receptor proteins. We seek to employ proteomic, genetic, and biochemical reconstitution approaches to investigate the role of yeast and human Cdc48/p97 in degradation of UPS substrates. The human ubiquitin system comprises hundreds of different enzymes including ~500 ubiquitin ligases, ~50 E2s, ~100 deubiquitinating enzymes, and about a dozen each of ubiquitin chain receptors and Cdc48/p97 complexes. Collectively, these factors target thousands of human proteins for degradation. One of the most intractable problems in the ubiquitin field is the identification of the proteins that are targeted for degradation by any one component of the UPS. We are employing a powerful mass spectrometry-based approach that enables the identification and quantification of ubiquitin-conjugated proteins in total cell extract, as the linchpin of a strategy to identify the proteins whose ubiquitination is altered in cells that are lacking individual components of the UPS (Figure 6). Figure 6: Strategy for identification of UPS ligands and substrates. To identify ubiquitin conjugates whose levels increase or decrease in a particular mutant or physiological state (in this case, a mutant lacking the proteasome substrate receptor Rpn10), wild type cells are grown in medium formulated with 'heavy' 15N nitrogen, whereas mutant cells are grown in medium formulated with normal 14N nitrogen. Immediately prior to analysis cells are mixed and lysed, and the cell extract is taken through a two-stage affinity purification to enrich specifically for ubiquitin conjugates destined for degradation by the proteasome. The resulting pool of conjugates is subjected to shotgun mass spectrometry (LC/LC-MS/MS) to identify its component proteins. Ratiometric quantification of the 14N and 15N isotopomers for each peptide reveals the impact of rpn10 on the levels of all detectable ubiquitin conjugates. Up to 550 different ubiquitin conjugates can be identified and quantified in a 10-hour mass spectrometry analysis. In the example shown, ubiquitin conjugates of the the 'circle' protein accumulate in rpn10 cells, and thus the 14N/15N ratios for peptides derived from this protein are predicted to be >1. On the other hand, ubiquitin conjugates of the hexagonal protein and the square contaminant yield equivalent levels of 14N and 15N peptide isotopomers. Figure 7: Protein phosphatase Cdc14 is released from the nucleolus during anaphase. Cdc14 (green) is localized to a discrete subnuclear domain (the nucleolus) during interphase, when cells contain either a single microtubule-organizing center or a short microtubule spindle (tubulin, red). In cells that have a long microtubule spindle indicative of late anaphase, Cdc14 is dispersed throughout the cell. Figure 8: Control of the exit from mitosis. Net1 retains Cdc14 in an inactive form within the nucleolus. Upon activation of the mitotic exit network (MEN), Cdc14 is released from Net1, diffuses throughout the cell, and activates mitotic cyclin proteolysis and the exit from mitosis by dephosphorylating the APC regulator Hct1/Cdh1. It is not known how the activity of the mitotic exit network brings about activation of Cdc14.